She is as close to any perfect example of what a blueblood should be; tall, elegant and like honey to the eyes. Her draconic influences make her stand out against many normal equine. Sitting just behind slender shoulders lies a single pair of vast periwinkle luminescent fringed wings that are soft in texture. Although the arms that support them are both scaled and furred, riddled with extended spikes. 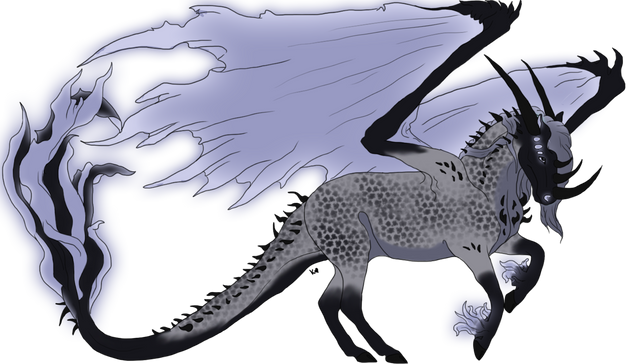 Her body is coated in ashen grey pelage and marked with darker dapples that start at her nape and end midways down her tail. Black adorns the draconic horns, spikes, face and limbs of her appearance. Her tail and long and sweeping, bending easily to her will and much like her wings the fringes glow in a soft light as well. Six luminous spots, three on each side of her almond shaped eyes, draw attention to her face and the threatening trail of horns that reside there. Her elongated jaws hide the long sharp fangs of her kind and keep her on a strictly carnivorous diet. While Lynette will forever be a dragon at heart she is more of a vixen in personality. She has learned that with a little bit of flattery, charm and persuasion she can have just about anything her heart desires. She works to seduce and unravel her victims, keeping them enamored until het gets what she is after. Much like a moth drawn to a roaring flame, burning before it realizes it is far too late. She has yet to accumulate too many no's in her game for she knows how to play it well. Everything she does it to her own personal gain, and hardly for others. Tenacity, confidence and tact are among her strongest traits, giving her the full arsenal she requires to fulfill her goals. Witty banter and sarcasm live on her tongue, ready to combat any negative remarks she so rarely receives. She prides herself in being self-reliant without the need of a man or anyone else giving her praise or acceptance. That is the hard outer shell of her thick dragon skin. But on the inside, should anyone take the time unearth her hidden gem worthy qualities they would find that despite all that she does, Lynette truly does have a heart of gold. While it is not necessarily heavily required for a grand duke or duchess to have an heir to take over the estate the couple so desperately wanted one. But perhaps not in the way that most hopeful parents wished. They desired an heir for the sole purpose of one day marrying them off, wedding them to a blueblood of higher authority. The only title that held higher than theirs being a prince or princess itself. To have ties to such nobility ensured that the family name and its riches would continue to grow. And so, it was with this thought in mind that Giselle and Marceau de Vigouroux tried and tried again to conceive a child. Rumors began to spread over the course of time that the Vigouroux line may be infertile. Tension ran high within the household estate for Giselle's inability to bare a child begin to put a strain on their marriage. On the night Marceau declared to his wife that he demanded a divorce she begged for him to lay with her one last time. And it was on this night that the gods worked in her favor. Many months later Lynette de Vigouroux was born much to her parents delight. The young blueblood was everything they hoped she would be and in time would certainly be fit to marry a young prince, thus binding their lineage to the king and queen's family. Her training to become a proper young lady started early, with an extensive list of lessons many other established women taught her. Being a fast learner Lynette quickly excelled in all of her studies with the great approval of her parents. At the tender age of one she was allowed on playdates with king Ignace's son, prince Antoine d'Havrincourt where she spent much of her time in the palace under the close scrutiny of both parents. The young foal's acquaintance with one another soon blossomed into a close friendship and it was only then that Marceau proposed that perhaps the two should be betrothed to one another. Although tentative, king Ignace accepted. Beginning at the age of two Giselle added the ways of espionage to her daughter's list of training along with personally teaching Lynette a few things in how to break a man down to bend to her will. As a test she was sent off on her first assignment at the age of three, where her mission was to gather intel on a neighboring kingdom that had made a name for itself in the last few years. She had always gathered information for the king to keep his reign strong and continuously proving her worth. But this was her first big break outside the boarders. Saying goodbye to prince Antoine, the young couple shared a kiss before parting ways. Lynette remained in the opposing kingdom for a year where she spent her fourth birthday in enemy territory. There she gathered all sorts of invaluable information, teasing it out of higher officials a little bit at a time with her charming grace and suggestive dances. Finally she learned of the seemingly quaint kingdom's intention to overthrow her king and fiancé. Gripped by the news the blueblood flew back to her home as fast as her wings would let her. Entering the palace with warnings on her lips she halted when met with the sight of her fiancé holding another woman, a common girl, in a rather intimate embrace. Words died on her lips and water swelled in her eyes upon seeing her love ultimately cheating on her. But sorrow was soon overcome with rage when Antoine dared to approach consul her, leaving the other woman behind. Try that he may to explain, his excuses were not enough to snuff the fires of the dragoness' flame. Out of her maw shot a volley of searing blue flame, burning hotter than any orange flame. Without hesitation the woman was burned alive leaving behind a charred crisp and with her, over half the room. And laying upon the ground with azure flame still licking his hide was Antoine. Though he would survive his wounds it would not be without great sacrifice. Fire elemental: The ability to create, manipulate, or shape fire to burn and or melt things. Apprentice: Lynette can expel small bursts of flame from her lips that are orange in coloration for only a few seconds at a time and even that comes with its drawbacks of lightheadedness or nosebleeds. Her hide is not as invincible to fire as it once was and can still be burned from a hot flame. In addition her body temperature can be raised can be raised to an uncomfortable degree to anyone near but this heat will not directly harm. Adept: She can now control and hold the breath of her flame for a longer period of time which has gone from orange to the true heat of blue that she once held before losing her abilities. The toughness of her skin has grown to withstand higher temperatures and her body can now envelop itself with flame in small areas for a few precious seconds such as her horns and tail. Although lightheadedness is still an issue. Master: With the prowess of her flame stoked to a higher level Lynette can release an azure torch of flame for as long as she can hold her breath and span quite the distance. She can now envelop her entire body in flame at once to act as a offensive attack or defensive shield. Her dragon hide is also immune to her own attacks and the plague of lightheadedness and headaches have left her. Virtuoso: Beware of this dragoness and the all consuming flame she conjures. For she can now release a wide, far stretching stream of flame without tiring. She can expel fire effortlessly from the horns and tail of her body. Said flames can also be condensed into a thin white hot beam of fire though it takes great concentration. Even her vast wings can be used to whip up a volley of fire.